Most people get started with Tapestry weaving by making a small sampler or two, but what is the next step on the journey to learning how to weave tapestry? There is a fairly large gap between that first small sampler and being able to use tapestry as a way to express yourself as a weaver. Why not try getting started on a daily practice that will help you focus on learning techniques while also providing an opportunity to become comfortable expressing yourself with the tapestry process, one day and one small space at a time? My first suggestion would be to start small. Maybe you will set up your loom and just start on the first day available or maybe you will think about how you want to proceed and start the following month, making a commitment to weave everyday for a small amount of time over the period of one month. There is no right way or wrong way. It is a diary, so it is all about you. If you are new to tapestry weaving consider making a narrow warp, about three to four inches wide so that you can weave all the way across for each days practice. Perhaps you will want to separate each day with a pass of a specific color. A illustrated tapestry book with clear photos or diagrams would also be useful in providing ideas about how to proceed. If you have more experience with tapestry you might want to devote the month to a specific tapestry technique like hatching, pick and pick variations or shape making. Consider this type of approach similar to how you might go about learning to play a musical instrument, a small amount of time devoted each day. Soon you will find that your hands are moving with more confidence and that ideas flow more freely when you are actively engaged in making. My first tapestry diary began in June of 2012 in a class with Tommye Scanlin at Arrowmont School in Tennessee. After the week of class I drove home and started weaving a small space representing my day, everyday; a special occasion , a patch of color, or a symbol. The first one covered the last week in June and all of July 2012, it was about 5 inches wide and sett at 8 threads per inch. Then I wove another for the month of August, and the third covered September through December 2012. There is a freedom in not having to make all the decisions about the entire design ahead of time that allows you to experiment and learn while also accomplishing something personal and meaningful. By the time 2013 came around I was ready to establish some rules to help me focus on a daily practice that would encompass the entire year. Because they are rules you set for your self they can easily be changed to suit your needs as the year progresses, but having some guidelines does help with getting started. My first yearly diary was warped at 7 inches wide at 8 threads to the inch and my rule was to confine myself to a rectangle space for each day of 1 inch by 2 inches. I established a repeating pattern of horizontal and vertical rectangles for each week. Each month was separated by a number for the month and some pick and pick tapestry technique and I decided to explore the color palette of some new yarns that I wanted to become better acquainted with. Since I had to warp more than once to get the length needed for the entire year I chose to work the project in three panels of four months each. 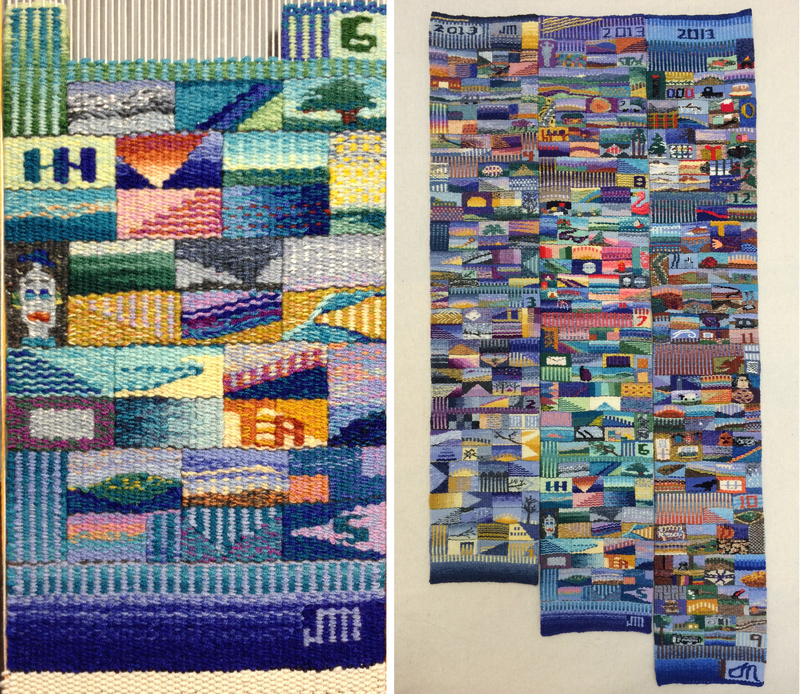 By the end of the year I had a substantial Tapestry Diary Triptych made up of small rectangles for each day. Even though I had kept the space for each day small there were still days when I could not find the 15 to 30 minutes it took to weave the day, or days when I was away from home and my loom. I decided to make up those days one way or another as I was able. Other solutions to this situation might be to weave a solid color to represent days away from your loom, there are many options. This year I am weaving another tapestry diary and continuing to learn and grow in my tapestry weaving through this simple process of daily practice. If you would like to learn more about weaving tapestry diaries and other weavers using this practice please refer to an article I wrote for the American Tapestry Alliance on the subject, http://americantapestryalliance.org/education/edu... 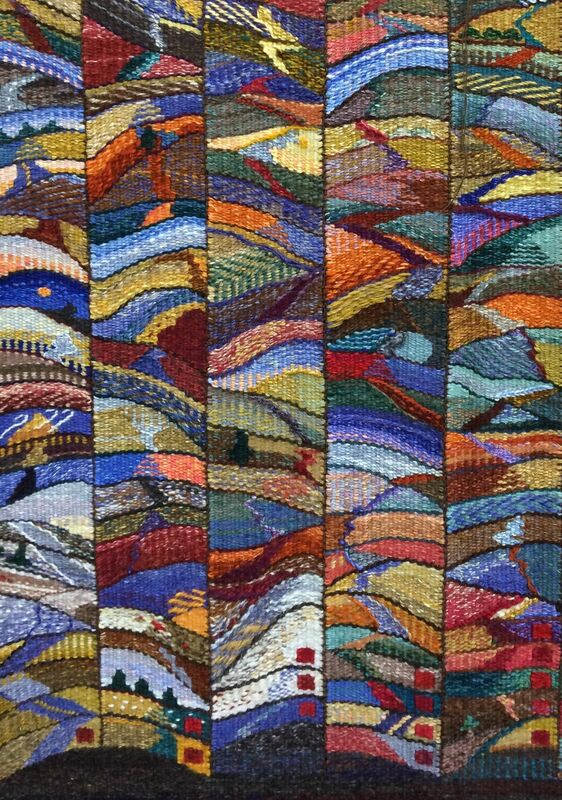 There you will find work by other tapestry weavers such as Tommye Scanlin who was the first to use the phrase “tapestry diary” and has been weaving them for several years now. I also follow along with my tapestry diary adventures on my blog, Common Threads. 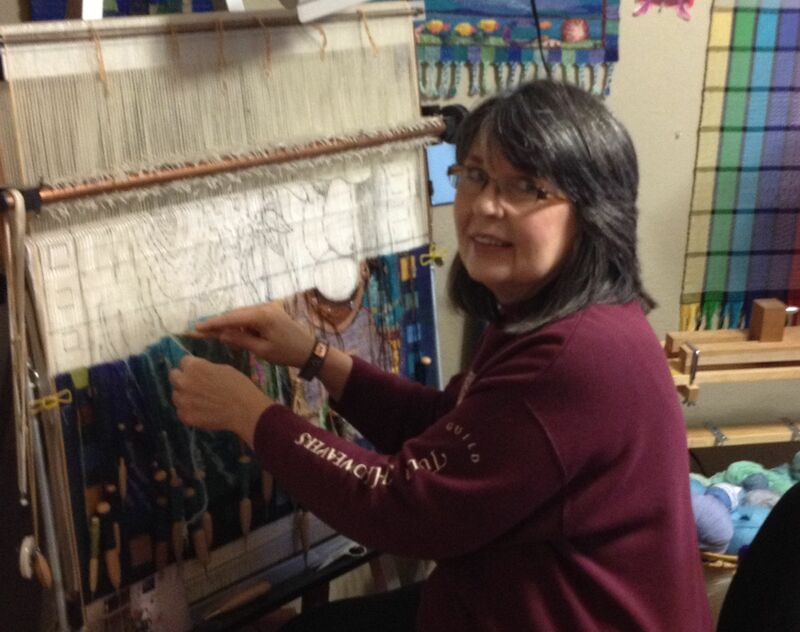 Janette Meetze lives and weaves in Bixby, Oklahoma. More information about her tapestry diaries, her Fiber Studio classes and supplies can be found on her blog, Common Threads.